James Anderson Moonie and his son William were both musicians. 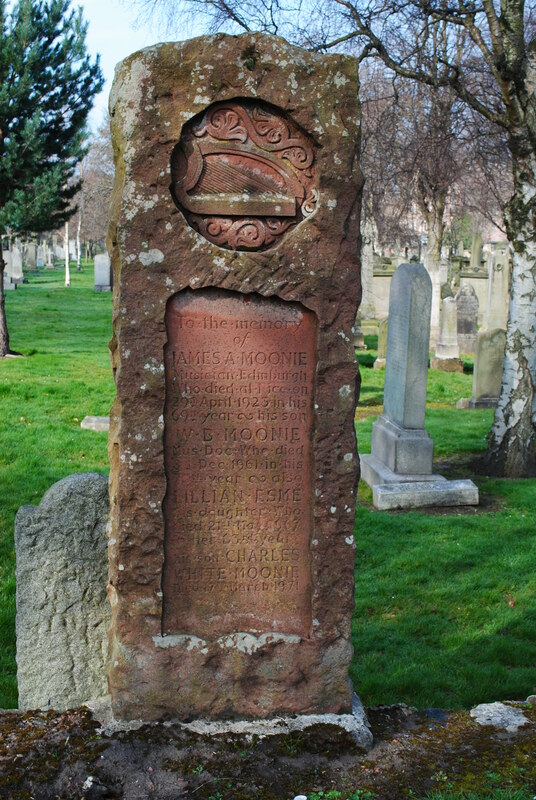 James was born in Edinburgh in 1853, and became a music teacher, founding Mr Moonie’s Choir in 1896. He married Clementina Greenaway in 1880, and they had five children: James, John, Charles, William and Lillian Esme. William, whose full name was William Walter Beaton Moonie but was known as ‘WB’, was born on 29 May 1883. He studied music at Edinburgh University. He then won a scholarship to Frankfurt, returning to Scotland in 1908, when he became a teacher at Daniel Stewart’s College. He composed a number of classical works, including three operas, but is best known for his works based on Scottish melodies. He was also Organist at Grange Parish Church (Marchmont St Giles). William married Janet Glegg and they had two children. He died in Edinburgh on 8 December 1961. In 1923 James Moonie was living at 19 Salisbury Road, but on 29 April he died of pneumonia on holiday in Nice. Lillian Esme emigrated to the USA, where her occupation is recorded as “secretary”. She died in Tennessee on 21 May 1967 at the age of 82. Charles White Moonie (1890-1971) died in Edinburgh. Their memorial stone commemorates James, WB, Lillian Esme and Charles.